Ed is a Certified Public Accountant (CPA) at Guerrero CPA. His past 17 years of experience with the Microsoft Great Plains, Customer Relationship Management, and Intuit QuickBooks of products provides him with a solid foundation of solutions to offer and recommend. Ed Guerrero founded the Steering Committee of Microsoft IAMCP - Microsoft Associations for Certified Partners in Austin and San Antonio. He has been a member of Microsoft Great Plains President's Club and Inner Circle for 14 years. He also serves on Technology Steering Committee for the Greater Chamber of Commerce and the Chairman of the Gold Member "Circle of Influence" Group for the Greater Chamber of Commerce for the past 5 years. Ed Guerrero was born and raised in San Antonio. He graduated from the University of Texas at San Antonio in 1987 with a Bachelor's Degree in Business Administration, majoring in both Accounting and Finance. Ed's experience includes over 26 years in areas like accounting, auditing, and technology. He became a Certified Public Accountant in 1989. He is also an entrepreneur that owns 12 other affiliated companies. Ed's interests include Taxation, Finance, Real Estate Investment, and Technology. During the Last 10 years, Ed has built a CPA practice which now includes over 3,700 clients. Based on each client's unique situation, he offers the following services: accounting, taxation, IRS representation and technology. His practice employs 20 full-time and 5 part-time personel. His practice is one of the fastest CPA firms growing in San Antonio at a 65% growth rate in revenue each year. About 80 times a year, Ed speaks about tax strategies and keeping the books to organizations such as UTSA, SBDC, ACCION, Various Chamber of Commerce and Real Estate Associations. Also, by hosting monthly luncheons and dinners for small business owners, Ed had been very successful in providing proactive tax strategies. He coaches and teaches new methods of Accounting, Taxation, Wealth Building and Tax Strategies. 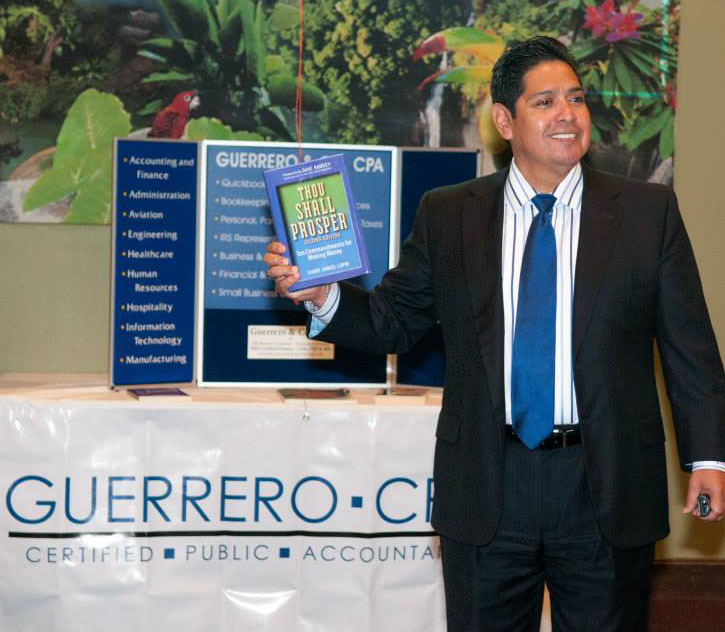 Guerrero CPA is a unique and dynamic organization that consists of CPA's, Accountants, Bookkeepers, Taxation Consultants, Software and Network Consultants, and Financial Advisors. The company continually strives to offer the highest quality professional services in the following areas: accounting, taxation, management advisory, tax services, IRS representation, outsourcing, and bookkeeping for small, medium, and large companies. Also, by utilizing a combination of business processes, business methodologies, and business technology, we can also provide solutions to issues that business owners encounter. Our philosophy does not just include preparing your taxes; we will take the time to educate you on methods to reduce your tax liability in order to "take your tax flow and turn it into cash flow".